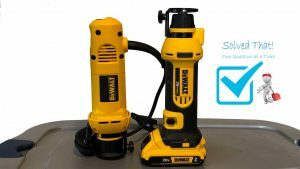 Tools Archives | Solved That! For about 30 years I have bought and used many stud finders. 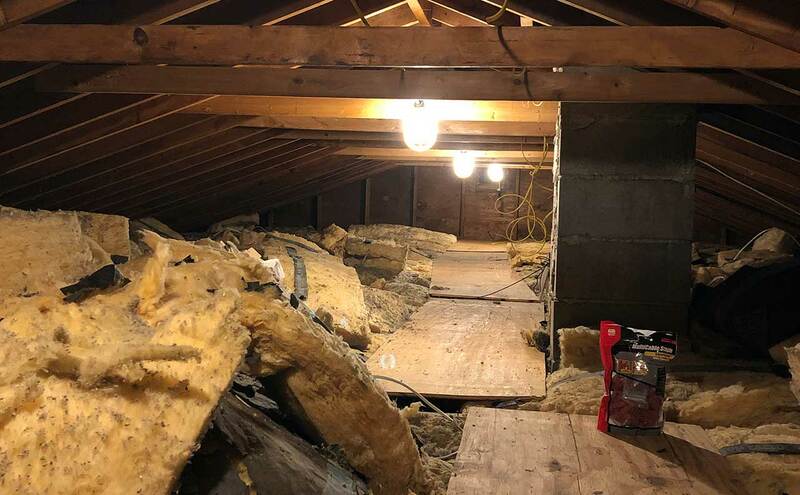 I have used stud finders remodeling my child hood home, I have used stud finders regularly for 20 years in my capacity as a property manager and also in my 31 years as a Maintenance Manager at a manufacturing company. While most work ok they are slow locating studs and sometimes give false readings. Sometimes when I’m in a rush I have found it faster to as a reference locate drywall screws by eye then mess with the stud finder. Interestingly the stud finders do seem to get better at locating electrical wires and re-bar. In December 2015 my girl and me bought a home and immediately upon moving in I created a punch list of important things that needed to be done. Mostly install network and cable tv jacks in all the walls. I decided it was a good time to buy another stud finder. 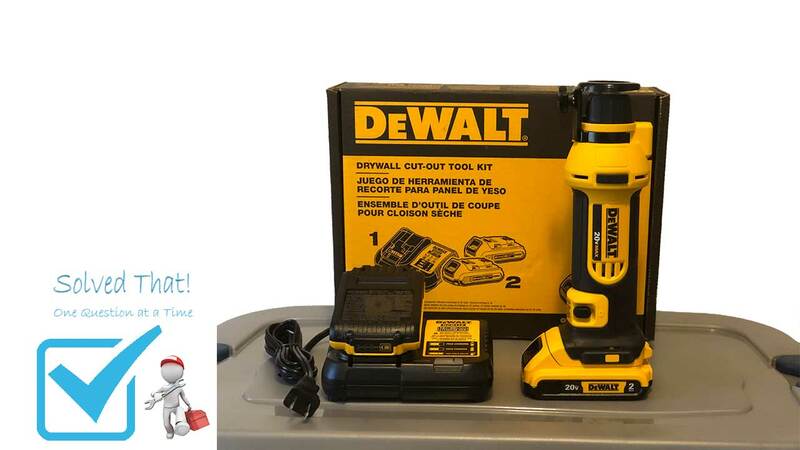 I wanted the best stud finder for drywall and 2x4 wall. I didn’t want to pay for features I didn’t care about. While having a stud finder that can detect live electrical wires is a great safety feature it was not a necessity. Off to Google search I went. A search of home improvement, DIY websites and forums revealed a stud finder I had never heard of before, the Franklin Sensors ProSensor 710 Precision Stud Finder. A quick trick to Amazon told me the stud finder was $50 and two day free prime shipping. I bought one and have been using it for nearly two years at the time of this post. 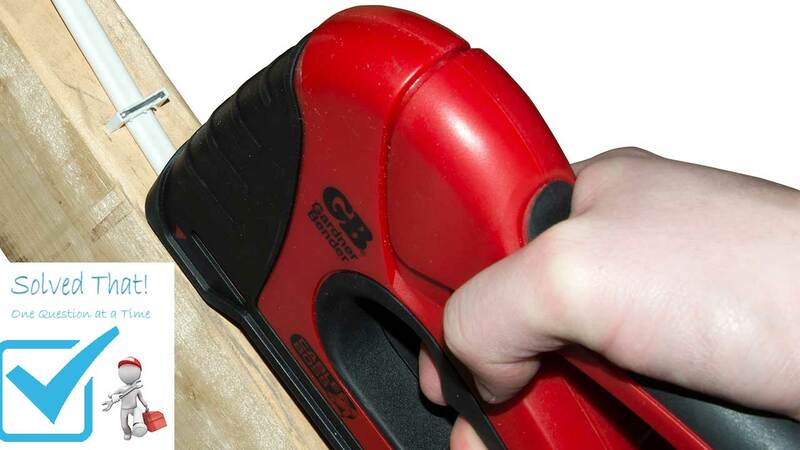 The ProSensor 710 Precision Stud Finder is a one trick pony, it detects studs through common building materials quickly and accurately or dare I say perfectly. The ProSensor 710 is very different than any other stud finder on the market. It uses thirteen sensors instead of the typical two and It’s shape reminds me of a grout float and one long edge has LED’s the entire length. The stud finder operates with a push of a button and when centered over a 2x4 stud three LED’S illuminate (like the picture at the top of the page). Anyhow for all the details read the manufacturers instructions below. I don’t need to repeat the information. 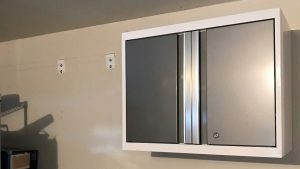 Today I was installing some Newage garage cabinets and I was really struck with how fast I was able to install the cabinets due to two tools the ProSensor 710 Stud Finder and a Tacklife SC-L03 – 98ft Crossline Self-Leveling Laser Level. I had to install 6 brackets with 12 1/4″ x 2 1/2″ lag bolts. After getting the brackets in place I ran a tape measure across the bolt heads and all were 16″ on center. Enough said. 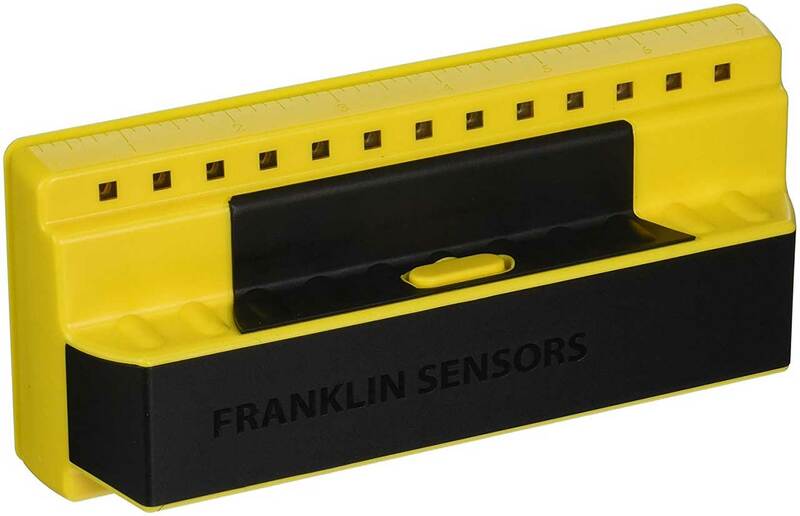 If you need a stud finder that is the best stud finder no need to look any further than the Franklin Sensors ProSensor 710. Designed with the professional contractor in mind, Franklin Sensors ProSensor is the most accurate and deepest sensing stud finder. 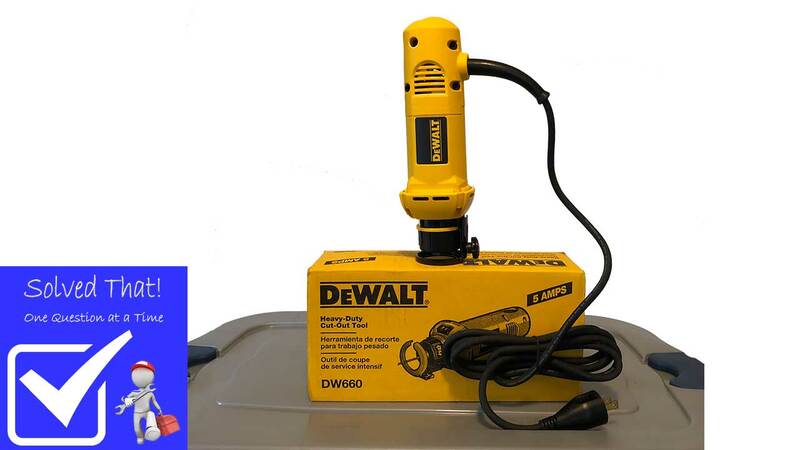 It has a max detection depth of 1.7” while still being tough enough to withstand being dropped off your ladder or tossed into the back of your truck. The 7” extra-wide LED display not only shows you the center and edge of studs, it can also save you time and read the width of multiple studs that you’ll find around windows and doors. 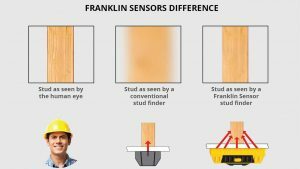 What makes Franklin Sensors ProSensor more accurate? Their patented Multi-Sense Technology. 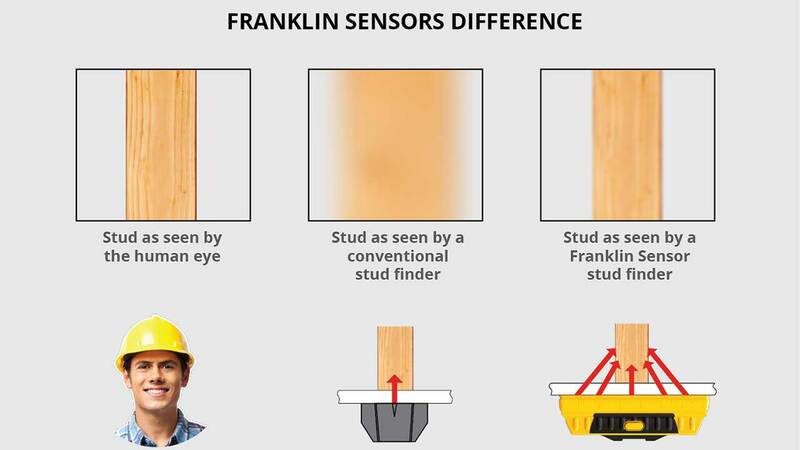 Conventional stud finders have one or two sensors, Franklin Sensors ProSensor has a range of 6 to a whopping 13 sensors! In the diagram below you’ll see that by only having one or two sensors, the “image” a sensor reads though a wall is unclear and blurry. This is why you get inaccurate readings from conventional stud finders. Our Franklin Sensors stud finders use multiple sensors to triangulate the data. In other words, more sensors provide more sensor readings – resulting in a larger sensing area and deeper, more accurate stud detection. We won’t waste your time with calibration procedures or inaccurate readings. Just press and scan to instantly find studs. We have also incorporated a few other features to make your job just that much quicker and easier. We hope you enjoy them. Our sensors have the widest display of any stud finder brand. Our horizontal LED displays range from 3 to 7 inches and display the stud’s center and edge simultaneously. No other stud finder can do that! Our larger models even display multiple studs simultaneously.